The formative years of American Presbyterianism occurred between 1706 and 1789. During those 83 years, early Presbyterians founded the first presbytery in Philadelphia, organized the first synod in 1716 and the first General Assembly in 1789. In addition, American Presbyterians formed about 24 presbyteries. Of the original presbyteries formed between 1706 and 1789, PHS holds records for 17 of them. The public services staff has created an early presbytery records guide that lists all the documents from these original presbyteries held at the Presbyterian Historical Society. From these records, we can witness American Presbyterianism in its genesis. If we look just at the formation dates of the presbyteries, we can learn a lot about early Presbyterian history. We see how American Presbyterianism started largely on the Mid-Atlantic seaboard with Philadelphia and New York City at its center. From 1706 to 1716, the highest Presbyterian governing body was the Presbytery. In 1716, colonial Presbyterians created the General Synod and divided the Presbytery into four presbyteries: Long Island, New Castle, Philadelphia and Snow Hill. The Synod of New York formed the first presbytery outside of the Mid-Atlantic region in 1755 with the organization of the Presbytery of Hanover, which included much of the southern colonies. Afterwards, we see presbyteries expanding into the American continent along with the general population. By 1781, Presbyterianism officially reached beyond the Allegheny Mountains when the Synod of New York and Philadelphia created the Presbytery of Redstone, which included southwestern Pennsylvania and northwestern Virginia. Presbyterians drove further into the American interior when the Synod of New York and Philadelphia created the Presbytery of Lexington in 1786. Another prevalent theme revealed in the early presbytery records is schisms and reunions. Within 39 years of forming the first presbytery, the Synod split into Old Side and New Side after the Great Awakening. The Synod divided into the Synod of Philadelphia (Old Side) and the Synod of New York (New Side) in 1745, but reunited in 1758 as the Synod of New York and Philadelphia. During those 13 years, presbyteries followed suit such as the Presbytery of New Castle, which divided in 1745. The Presbytery of Philadelphia also split into two separate bodies from 1762 to 1786, partially due to tensions left over from the Old Side-New Side split. We also see short lived presbyteries. The shortest one was the Presbytery of Lancaster, which was created in 1765 and lasted one year. It was created when the Synod of New York and Philadelphia dissolved the Presbytery of New Castle. The Synod dissolved Lancaster in 1766 when it reconstituted the Presbytery of New Castle. The most intriguing of the short-lived colonial presbyteries is Snow Hill, because it was one of the original four created in 1716. Leonard Trinterud, in his book The Forming of an American Tradition: a Re-examination of Colonial Presbyterianism, suggests the presbytery never met. Coincidentally, there are no minutes of the Presbytery of Snow Hill deposited at the Historical Society. Please note that Columbia Theological Seminary in Decatur, Georgia, holds some of the minutes of the original presbyteries. 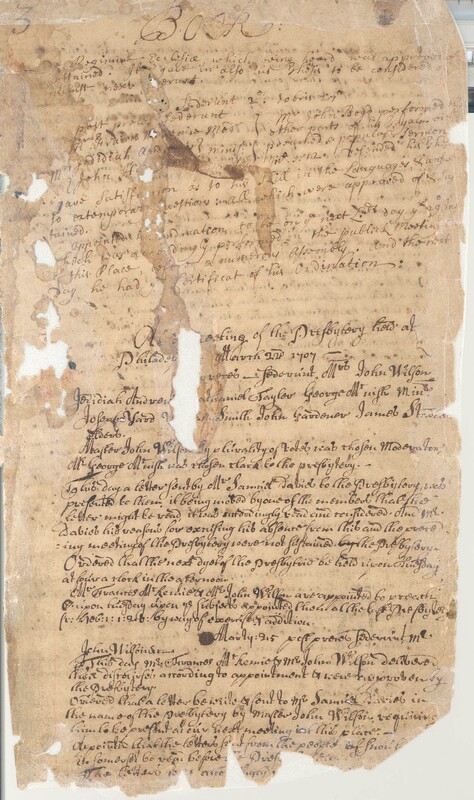 If you have any questions about early presbytery records, please contact the public services staff at the Presbyterian Historical Society for further information.